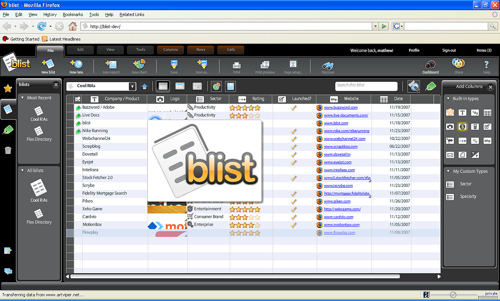 I just got excited about a really cool product: Blist. They describe themselves as, “a database for the rest of us”. Basically, Blist allows anyone to create a database, you don’t have to be a programmer or DBA in order to do this anymore. I liked the way the presenter described how so many of us twist programs like Excel to our needs. We do, and it generally doesn’t work very well. Have you ever tried inserting images into cells on Excel? Not fun, easy or usable. Anyway, I’m going to get on the beta list and try this out in greater detail. I really like the potential of this product. Possibly the best execution on a demonstration yet, absolutely flawless. Voyant @Home is allows you to manage your financial planning on your own. You can model different financial options, and you can also visually see what those decisions might mean for you. When I first heard about their service, I thought it was a competitor of applications like Mint. It’s not though, if anything it starts where financial tools like Mint leave off. The social tools available within the Voyant @Home application look interesting as well. Definitely one to watch. This is an interesting device that cuts out a lot of the wire clutter you see at desks worldwide. This technology allows for the charging of multiple DC-powered devices with differing power requirements from a single power supply. Actually, the website for Voyant is http://www.PlanWithVoyant.com.